I've only read one Colleen Hoover book so far, which was Maybe Someday but I cried so many times. I even bought the soundtrack off iTunes so I can list to it all the time. My favorite Colleen Hoover book is Slammed. But I love all of her books that I have read. I would love to read November 9. I've only read her NN series with Tarryn, but I love it and can't wait to read the final installment next year. i only read HOPELESS and i like it! I've never read any book by her! I haven't read one yet but November 9 is one that sounds good and its the one I want to start with. I've only read hopeless but fell in love with it fast! I love her writing in the book and I've been dying to read more from her! I've only read hopeless but fell in love with it fast! I love her writing in it and I've been dying to read more from her. My favorite Colleen Hoover book is Hopeless. 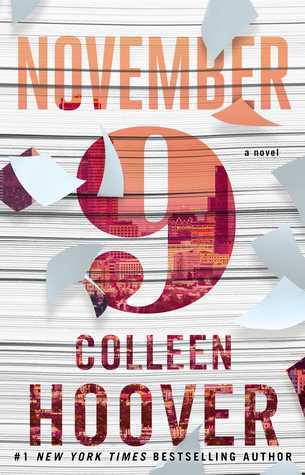 I haven't read any by Colleen Hoover yet, but would love to sink my teeth into November 9. I have never read anything by Colleen Hoover yet! My favorite would be the next one I read. I have not read any of her work. I have yet to read any Colleen Hoover but would love the chance to. Thank you for the chance, I hav heard great things about this book! Colleen Hoover is a new to me author, but I know that I am going to love November 9! I really like all her books, but I guess Slammed would be my favorite!! My favorite ones are Hopeless and Slammed! Hopeless is my favorite. Thanks for the giveaway! I like Slammed a lot. I have only read Slammed and I enjoyed it. I have read many great things about November 9, thanks for the chance to win! I have read all of her books except Confess and November 9. I love them all but I guess Hopeless is my favorite. I am still waiting to read my first, but I have heard great things about "November 9" and it is on my to-read list already! I have not read any of her books...yet. I'll always enjoy them all but I really liked Ugly Love. Thank you! I don't think I've read any of her novels. Ugly Love is my favorite, can't wait for the movie! I've only read a couple. Hopeless was really good! Ugly Love is my favorite then it's Hopeless. Thanks for the chance! This is the best giveaway! I Love Colleen Hoover! My favorite novel is Hopeless, my first CoHo! I still love Maybe Someday the most!! i can re-read that book over and over! Ugly Love and Confess are my favorites! I've seen CoHo during a signing (a birthday gift for a friend) but have yet to read her. I have not read November Nine yet but my fav book from CoHo by far is Confess! Hopeless is my favorite ! I have not read any books by CoHo yet. But my blogging buddy sent me an early Christmas present, which was Ugly Love, and I can't wait to start it! I have not read any, so I thank you so the introduction. Ugly love, Maybe Someday and Confess are my favorites by far. Maybe Someday is the best! Ridge baby is there! I haven't read anything by her yet. My favorite book from Colleen Hoover is Maybe Someday. It was an emotional rollercoaster but I'd ride it again definitely! I loved it so much, it's an excellent book <3 Thanks for the chance! So far I've only read two of her books, Hopeless and Ugly Love. I realllllllly enjoyed Ugly Love. I think I cried so hard that my eyeballs dried up. Thanks for the giveaway! I really loved Hopeless and Slammed too!! I've never read one of her books yet so am anxious to start now! Hopeless is the only one I have read. It's a tie between Slammed and Point of Retreat.